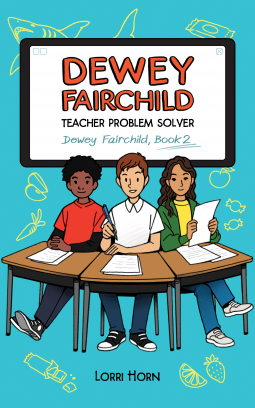 In this follow-up to Dewey Fairchild, Parent Problem Solver, our genius problem solver, Dewey, takes up the challenge of troublesome teachers after a client shows up desperate to pacify his teacher. It turns out that tons of kids have problem teachers, so he’s soon up to his neck in cases—from classic cases of teachers who are soo boring to bizarre cases like the teacher who leaves students scared of water—even water fountains. Meanwhile, Dewey's school starts limiting toilet paper use—to just one tiny square at a time!—and replaces Dewey’s beloved vending machines with . . . a garden. That's no substitute for the delightful snacks Dewey lives for, so he and his best friends protest with a secret demonstration involving edible additions to school property. But detention may be the least of their problems when some argue their actions were vandalism. Will their demands for student involvement sway the administration, or will they be caught and punished with detention . . . or worse? Lorri Horn is an educator and the author of Dewey Fairchild, Parent Problem Solver, which received a starred review from Kirkus Reviews, who included it amongst the “Best Middle-Grade Books of 2017.” She has a degree in English, a teaching credential, has been Nationally Board Certified, and taught public school for over 14 years. Lorri lives in California with her husband, son, and their dog, Wolfie.